Try our new Knorr® Selects™ sides made without any artificial flavors or preservatives. Simply put, sweet and savoury is a classic combination that gets those taste buds excited. 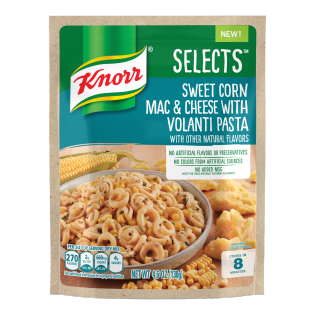 We took this idea to heart when creating our Knorr Selects Sweet Corn Mac & Cheese with Volanti Pasta (4.6oz). We took an extra-mouthwatering blend of parmesan, romano, asiago, and cheddar cheese and combined them with volanti pasta for a creamy, sweet and savory side you'll want to have as your main meal instead. Sweet Corn Mac & Cheese with Volanti Pasta is rated 3.6 out of 5 by 38. Rated 5 out of 5 by atrovie04 from Quick and Delicious Meal Add In! We followed the recipe on the back of the packaging and it was very yummy! The whole family including two children under 5 enjoyed the meal. We used turkey sausage and followed everything except added in a little extra sweet corn. No extra seasoning added and it was still very flavorful. I do think I should note we simmered the pasta on low until cooked which was a bit over the cooking time listed but that wasn’t an issue as it sat on the back burner as I worked on the other ingredients. From start to finish, it took less than an hour and wasn’t complicated and looked and tasted fresh. Rated 1 out of 5 by Marina22 from The worst thing I’ve ever tasted ... Wow. I cannot believe how bad this was. All the terrible reviews are correct. This product is disgusting. The pasta can not possible be cooked in the amount of time given. The flavor is bland. The corn is barely sweet. A complete waste of time and money. Luckily I read the reviews first so I didn’t bother making this for the family. I basically cooked this on my own time to see how it was. Well after eating some of it, I’ve actually been quite sick for a couple of days now. My stomache just feels weird. I rarely ever get sick! Do not buy this product! Rated 1 out of 5 by Knorr PastaSides Fan from Don't. Just don't. This is the nastiest Knorr product I've had. Nasty enough to inspire me to write a review. After following the stovetop directions to the letter, the corn kernels had the consistency of rocks. And the powdered cheese was bitter (but I should've expected that). I've now learned the hard way to stick with the simple sides like Butter or Alfredo Noodles. The ones like this one with 8-word names are usually pretty bad. Rated 2 out of 5 by Tina92 from Good flavor but noodles didn’t cook Followed directions to a “T”. After the instructed 8 minutes, noodles were no where near tender and some still crunchy. Added an extra 5 minutes, still not tender. Something was not right. Maybe the instructions should include covering or not enough water?